We are a company that aims to grow without bounds and overcome all challenges with perseverance. We are truly grateful to be able to celebrate the 20th anniversary of the foundation of our company. Despite recent tough economic times, Sugiura Tekkin has been able to increase profits every year since the year we were founded thanks to the support of our customers and affiliated companies. Our gratitude is overwhelming, and while we still have much to learn, we pledge to always put our best foot forward.. We value the love of meeting challenges above all, and understand that giving in to today's hard economic times will surely lead to demise. As a rebar construction specialist company, we will never be satisfied with the present, and will constantly seek new frontiers while continuing to grow and learn from our mistakes -a philosophy dear to us at Sugiura Tekkin. We are a young company that continues to grow, and will continue to expand and cultivate the power of the fighting spirit. In this way, we can truly show our gratitude and fulfill the expectations of our patrons. Among our goals is not only the improvement of the quality of our manufacturing, but every kind of service offered from the exactness of assembly to the punctuality of delivery. Through capital investment and business development, we strive to increase production capacity as well as efficiency. Along with enhancing internal structure, including division of labor and business systems, we can develop our workers by enriching education. 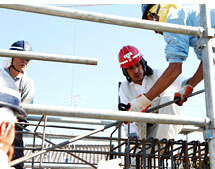 Rebar is the backbone that supports our society. That is why every single piece is made with purpose and care. Bringing imagination to life with the finest materials. 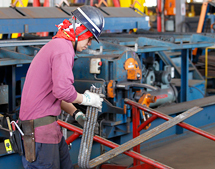 We believe there are three main focuses when it comes to manufacturing high quality rebar. The first of these is a manufacturing log taken by a foreman on site. Based on the blueprints, he carefully and precisely selects and tallies what steel materials will be needed. The second focus is a manufacturing line that uses reliable equipment. Using automated machines for manufacturing processes such as cutting and bending rebar not only ensures consistency and quality, but also reduces the amount of labor required of workers. The third focus is an original barcode-based item management system which prevents careless mistakes and ensures smooth progress management. After finishing the manufacturing process, we of course inspect each product's tag one by one, but as error prevention is paramount in our industry, we work tirelessly to provide a defect free product to our customers. Construction with absolute blueprint conformity. Rebar assembly that aspires to the true meaning of blueprints. On the worksite, we take rebar from the factory and carefully assemble it piece by piece according to the blueprints, often with accuracy down to the millimeter. It may be difficult to differentiate some rebar materials at a glance, but there are foundation pieces, slabs, pillars, and beams which all have their own unique characteristics and applications. That is why we make a concerted effort to educate our staff. We hope to instill a mindset in our workers that enables them to have a conscious understanding of each separate task, and to take into consideration different aspects of the construction of each project beforehand. We also employ a unit construction method which allows us to ensure that all products are quality-made beforehand from within the factory on demand. A stocking system that never skips a beat. Plenty of storage space for peace of mind. A unique characteristic of our company is the rebar stocking system based on our "Profit Creation Model," which anticipates market price. 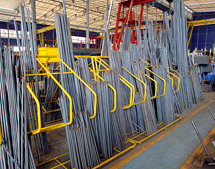 The price of steel material is easily influenced by the state of the economy, which can sometimes be risky. However, we look into the scrap price trends as well as demand, and are always watching the cost of products from manufacturers in order to keep materials stocked and ready for orders. . The steel material stocked is stored in a generously spacious warehouse. We are also very careful to preserve the quality of the material when stocking. 70-80% of our rebar construction orders include orders of steel materials. That is because we are very particular about the material we use, and consistently store large volumes of material between 3000 and 5000 tons. We also work with and strive to meet the demands of retail stores. * We accept orders from retail stores of 5000 tons or greater. We aim to maintain consistent quality and reduced construction time by ensuring quality production from within the factory. We provide consistent quality and avoid deviations in the pitch of straps by using unit-specific machinery when spot welding in our factory. Compared to conventional construction methods, unit construction makes it possible to decrease construction time and improve ease of construction site. Protecting your lifestyle while you live it. Moving forward in the rebar industry, resolutely, one step at a time. We count on the people who count on us. Flourishing in a tough economy thanks to our customers. WPutting our challenges first – without fear of change. Moved factory to Kutsukake-Cho, Toyoake, and expanded to 1324 square meters. Incorporated SUGIURA TEKKIN as a private limited company. Started corporate business with 3 million yen capital stock. 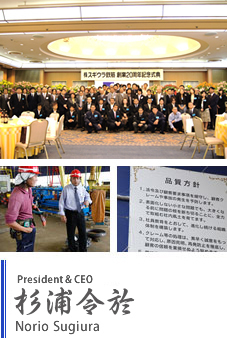 Opened SUGIURA TEKKIN as a publicly traded company. Increased capital stock to 10 million yen. Purchased 2979 square meter headquarters in Kutsukake-Cho, Toyoake. Setup A & B Lines. Opened second factory on 993 square meters of land. Created operations strategy. Set 3 year plan in motion. Acquired another 2979 square meters of land and established C Line. Company factory expanded to a total of 5958 square meters, allowing for 5000 tons of storage. Copyright (C) 2009 SUGIURA TEKKIN co.,ltd. All rights Resatved.